1. He has something to prove. 2. He knows that at age 31 it might be his last chance to prove it. Pride is a great motivator and Clint’s is on the line. No professional athlete wants to be told he can’t get the job done any more – especially after having been on top of his game just last year. He finished 10th in the standings – only nine drivers had a better season — but in a what-have-you-done-lately sport last year’s success didn’t soothe this season’s struggles. As the Chase for the Chase wound down it became apparent that Bowyer would be the odd man out – out of the playoffs and perhaps out a job. Clint is a native of Emporia, Kansas, and his racing career has some Nashville angles woven through it. I’ve followed him fairly closely and been impressed. 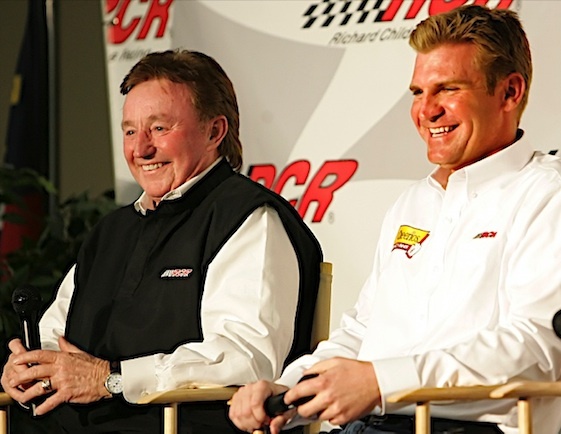 It was at Nashville’s Fairgrounds Speedway in 2003 that Bowyer finished second in an ARCA race and caught the eye of Richard Childress. Childress offered him a ride, giving him his big career break. One of Bowyer’s Cup sponsors was Jack Daniels and he made occasional promotional visits to the company’s headquarters down the road in Lynchburg. From a media standpoint I’ve always found Clint to be one of the Cup series’ most accessible and accommodating drivers, even when things aren’t going well. Now he’s facing a career crossroads and it’ll be interesting to see what happens. Remember when Kyle Busch underwent a similar challenge? After four seasons with Hendrick Motorports Busch was nudged out. He landed with Joe Gibbs Racing and in his first season with his new team he won eight races and hasn’t looked back. Will Bowyer respond similarly? His anticipated new Michael Waltrip Racing ride is not on par with Kyle’s Joe Gibbs Racing rocket, but Waltrip has proven he can field winners and in Bowyer he’ll have one of NASCAR’s most motivated drivers behind the wheel. The season has nine races remaining and I don’t think Bowyer will be content to simply run out the clock – witness Monday’s solid 7th-place finish at Chicagoland Speedway. Even though he’s not eligible for the championship you can bet he’d like to make a statement down the stretch. What better parting gift – or parting shot – than to wheel his RCR Chevy into Victory Circle one more time? For the rest of the season Bowyer will be driving like someone with nothing to lose. And next season he’ll be racing like someone with something to prove. Great article!! I am Clint Bowyer fan and win or lose…I support him. He just seems like such a great guy and not to mention a talented driver. I feel like he doesnt get the recognition he deserves MANY times!! I think Michael Waltrip is awesome!! He is so funny, down to earth and a very neat person as well and I am one fan who would LOVE to see Clint get a FRESH new start away from the “good ol boys” organization where he can SHINE!!! Looking forward to following his career and see how well he does!